Its something new for Bobby and I am sure once he got used to the car ride, he will enjoy it. He might be the 1st one getting into the car the next time you open the car door. Good Morning Lisa, I just love stories about Bobby. He is a cool cat! 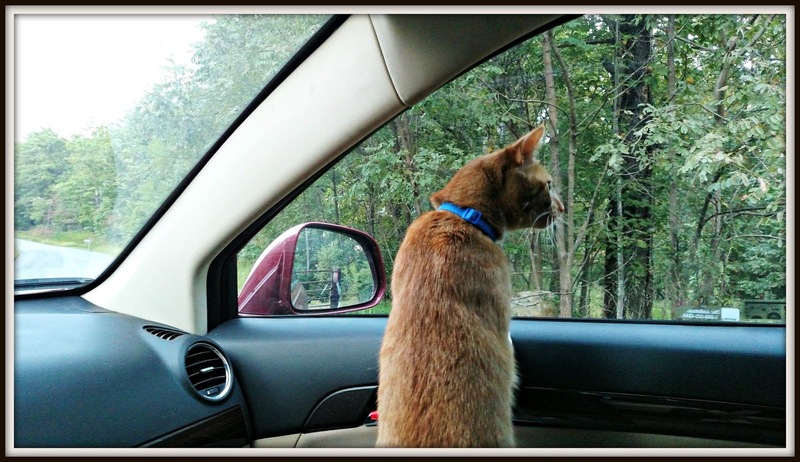 How funny that he did not react as most cats do to riding in a car. He is very unique! I imagine he would grow to love it in time. All i have given rides to have howled unless sedated.A neighbor has a friend who takes hers everywhere with her. SO cool! I love this experiment! Post more of him; you know we are cat lovers. Now, what is Mancala? I will Google it, maybe the girls will like it. This made me giggle so much; what a special cat Bobby is!!! How fun, lol. I love the picture, looks like he's curious for sure! Bobby is enjoying the ride I guess :).. My kids wanted to have cats but we can;t keep pet in this rented house..
Well, I take my dog for rides, so why not? My cats howl like crazy. Of course, they're always headed to the vet. Glad he enjoyed it. Our poor little girl Skye hates the car because she knows it goes to the vet or the groomer. We've never really had our dogs in the cars but I know wish we had done that with Skye. Hey if Bobby likes it - great! How funny that cats are like people. We are all different. Love it! Bobby is one fun kitty!